Ultimate Gay Fighter is seeking suggestions from fans after being forced to change its name by a "large MMA promotional company" that will go unnamed. You may not have heard of Ultimate Gay Fighter, but at least one heavyweight company in the MMA business has, and it wasn't happy with what it sees as an infringement upon its trademark. 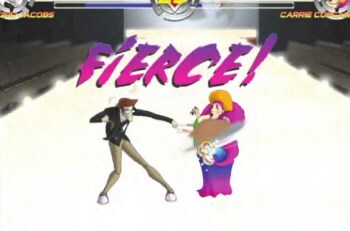 The promotion, which Ultimate Gay Fighter developer Handsome Woman Productions did not name (but you can probably figure it out) threatened legal action if the name wasn't changed, and as a "mom and pop production company" the studio decided it had no choice but to comply. "This decision was not easy. This potential legal situation already delayed the game several months as we deliberated our options. Our mobile gaming product is vastly different from their brand and related products," the studio wrote in a message on Facebook. "At the end of the day, our strong belief in releasing this game remains most important, and we did not want to lose everything we have worked so hard for." Founder Michael P. Venker told Polygon that it has a pending trademark on the title, but it doesn't have the financial clout to defend it against a major corporation with a "take-no-prisoners" approach to disputes. "We offered them solutions, but this company remains firm in believing our Ultimate Gay Fighter brand threatens their brand, despite vast differences in our customer base and product," he said. With the decision made, the studio decided to put the matter in the hands of its supporters. "We wanted to give our fans a chance to come up with a new name for Ultimate Gay Fighter, knowing we've had your support throughout this journey - from the fan art you've given us to the heartfelt messages we've received. We owe this to you," it continued. "We are so proud to hear your stories, and thank you so much for sharing your lives with us. With your continued strong support, we will make this a wonderful experience for everyone." Ultimate Gay Fighter is currently slated to come out later this year.